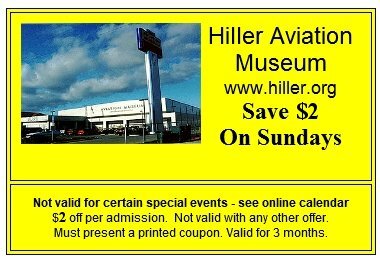 The Hiller Aviation Museum is an exciting place for you and your family to explore aviation and science. It’s an experience ideal for all ages, so make plans for a visit to the Hiller Aviation Museum: Where inspiration takes flight. Open 7 days a week, 10am to 5pm. Bring this coupon on Sundays for a $2 discount off each admission. Sorry, coupon not valid on certain Sundays. See Online Schedule for details. MasterCard®, VISA®, and American Express® accepted. Print this page and coupon!